Hey folks! I'm your new president! My name is Donald K Jump, I'm 275 years old and I came from United States! 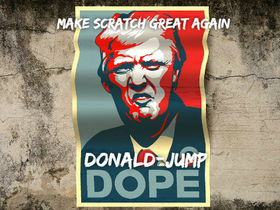 Scratch is getting worse right now, and I promise that I will make Scratch GREAT again! I am currently working in the white house, and my job is to make scratch great again! COMMENT FOR A FREE FOLLOW!!!!! MAKE SURE TO FOLLOW MEH AND CHECK OUT ALL THE PROJECTS AS THERE ARE BIG GIVEWAYS!! Irwin Escapes Prison Background Character Designs! !